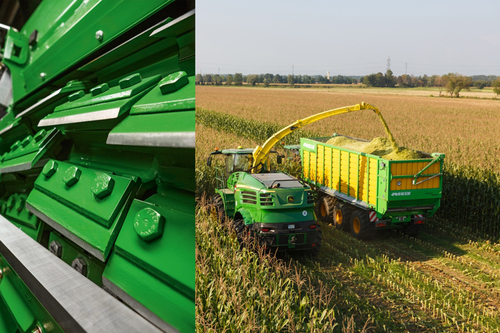 The innovation committee of the German Agricultural Society (Deutsche Landwirtschaftsgesellschaft - DLG) has recognised numerous innovations from John Deere and partner companies with three gold and 10 silver medals. The award winning innovations were selected from 311 entries and will be presented at this year’s Agritechnica, the world’s largest agricultural equipment fair (10-14 November 2015 in Hannover, Germany). “The large number of awards is a result of the company’s continuing high investment into research and development,” said Chris Wigger, John Deere’s Region 2* vice-president sales & marketing. “We are particularly proud that our industry partners and service providers can take a lot of the credit for achieving these significant results. As our industry undergoes a paradigm shift towards more integrated technology, these jointly awarded intelligent solutions clearly demonstrate John Deere’s commitment to system openness and our willingness to collaborate with partners. Arable farmers and contractors will benefit from these developments,” Wigger added. System which monitors and adjusts the spacing between the knives and the shearbar of the forager’s cutting drum on-the-go. High precision sensors incorporated in the shearbar continuously measure the spacing between knives and shearbar and monitor the sharpness of the knives. Nutrient management system for the precise application of organic or mineral fertilisers (nitrogen and phosphate) as required. The system allows a holistic view from harvest to harvest and includes technologies that provide highly precise fertiliser application. Knowhow and technologies contributed by distinguished business partners are integrated to enable a fertiliser application that is regulation compliant with the German fertiliser directive (DVO). Intuitive decision support tool to ensure a timely and precise application of pesticides. The partnering companies integrate application recommendations, adequate solvents handling, operator support, application handling, automatic compliance with buffer zone requirements and seamless documentation into a comprehensive solution. Flexible system to quickly link a 1.7-tonne ballast weight to the bottom of the tractor chassis from the operator cab. EZ Ballast does not compete for linkage space needed for implements and helps to optimise the weight distribution of the tractor. Thus, it helps to enhance productivity and to reduce the cost of operation. The world’s first self-learning headland management tool for a tractor. The headland management system automatically records all handling steps activated by the driver, and saves useful commands to propose their re-use on the next suitable occasion. System to automatically optimise the distribution of traction force on tractors equipped with four-wheel drive. Depending on axle load, wheel slip and actual tractor speed, four-wheel drive is automatically engaged or disengaged as required, thus enhancing operator comfort by reducing stress and misuse. 3D Camera System to monitor the immediate periphery of a machine; display of up to six different types of view to enhance operational safety of tractors and harvesting machinery; increases safety of manoeuvring, front loader and transportation work. ICA2 is the first fully integrated and market-ready system for the optimisation of combine settings. Apart from grain losses, grain quality will also be included in the optimisation process. After setting and utilising ICA2, even a novice operator will be able to maintain expert operator performance throughout the harvest day. First combine simulator that provides a real operating environment for the year-round training of combine drivers. State-of-the-art software enables realistic machine handling and a ‘true’ harvesting experience, whereby individual learning modules provide step-by-step training of increasing complexity. The newly designed Active Yield system automates the time-consuming calibration steps required to measure crop yields. To achieve maximum yield monitoring precision, manual weighing of samples is made obsolete. Innovative solution for the harvesting of silage. By integrating the forager’s ‘intelligent’ spout control and the real-time synchronisation of transport vehicles with the forager, the driver can be relieved from stress with the support of sensors as he approaches a field, begins to harvest and completely fills the trailer. For the first time, a manufacturer offers a comprehensive quality assurance system covering the whole drilling process. The system provides sensor-based monitoring, control and documentation of drilling and includes new automated solutions which significantly enhance plant distribution and seed placement in varying conditions. Ultimately, this frees up time for the operator, who can concentrate more effectively on the actual drilling process. Control of all the major settings of a combination tillage implement from the tractor cab. Once a major component setting is re-adjusted, the settings of the remaining elements are automatically adjusted in turn. The TrueSet concept lays the foundation for new solutions within the framework of precision tillage applications.